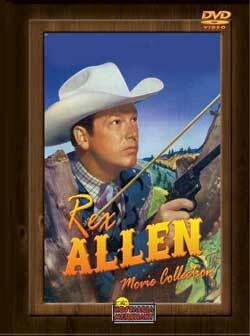 Rex Allen started out as a singer in vaudeville, and sang on numerous radio shows before hooking up with a traveling rodeo show. He signed with Republic Pictures and became a singing cowboy, and was often paired with sidekick Slim Pickens. He starred in his own western TV series “Frontier Doctor” in 1958. Two of these shows are on Disc 10 of this set. The Arizona Cowboy (1950) / Hills of Oklahoma (1950) / Redwood Forest Trail (1950) / Under Mexicali Stars (1050) / Silver City Bonanza (1951) / Thunder in God’s Country (1951) / Rodeo King and the Senorita (1951) / Utah Wagon Train (1951) / Colorado Sundown (1952) / The Last Musketeer (1951) / Border Saddlemates (1952) / Old Oklahoma Plains (1952) / South Pacific Trail (1952) / Old Overland Trail (1953) / Iron Mountain Trail (1953) / Down Laredo Way (1953) / Shadows of Tombstone (1953) / Red River Shore (1953) / Phantom Stallion (1954) / and 2 Bonus TV Shows.